Did you know that by completing 5 out of the 10 activities on the checklist each month, your child can get prize each month at Terra Toys? That's right..... every month they can get a new prize! Christmas in July- Sit on Santa's lap, enjoy Christmas music, trivia, giveaways, instant snow demonstrations, and delicious Christmas treats! Shark Week- Celebrate sharks with trivia, prizes and giveaways! There will be live demos of dig-your-own shark tooth and lots of plush, plastic and candy sharks of all shapes sizes. Every shark purchase gets you a free Shark Week Bingo board to play while watching any of the Shark Week shows. FREE! The article below was originally posted on FreeFuninAustin.com and shows just how great this great Austin toy store is! Terra Toys makes me smile. It has all the fun-loving, funky flavor of Austin and is packed to the brim with every kind of toy and doll imaginable. The best part: you can actually play with the toys! This makes it a fun destination for my kids when the weather is hot and we just need a little cheering up. 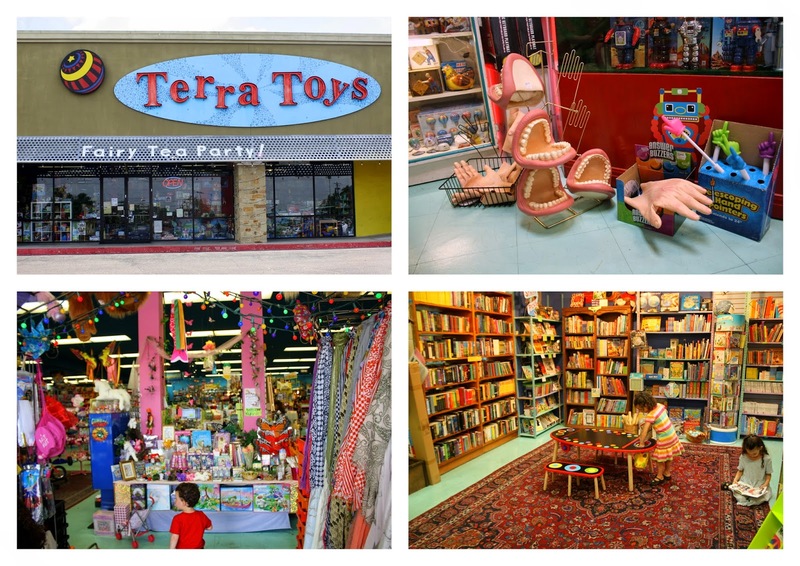 Over 25 years ago, Terra Toys started out as a family-owned snow cone stand that made some extra income in the winter months by selling hand-carved toys. Since then, they've gone through several expansions, and today they sell items from over 900 vendors at their 12,000 square foot North Austin location- so there's lots to look at and explore! I love that they carry classic, interesting, and beautiful toys; very few require batteries. Probably the most enjoyable part of our morning for my four and six-year-olds was creeping me out with the giant hand and mouth puppets they found in one corner. Other play stops in our journey around the store included: the really cool wooden rainsticks that were hand-made by Terra Toys employees, a couple of train tables, various musical instruments, the puppet area, a dollhouse, a vintage pink swirly chair that for some reason captivated just about every child in the store, and the numerous bins of bouncy balls and novelty thingamajigs. My kids would have loved to have stayed longer, but thankfully, they were hungry; so I was able to lure them out of the store with promises of food. We will be back another day. The fun-loving, knowledgeable employees and laid-back, play-friendly policy of the store make it a stress-free destination. Terra Toys is a sponsor of the I Heart Austin Summer Fun Checklist, a FREE, printable checklist for kids 12 and under. The checklist, broken down by 10 items per month in June, July and August, lists a wide variety of Austin-area activities for kids and their families to do this summer. Each month, once a child checks off at least 5 items on the checklist, they can bring it into Terra Toys to redeem for a Mystery Grab Bag Prize! That's right, kids are rewarded for staying active and engaged in their community all summer long! For more details, check out the Austin Summer Fun website, where you can download and print the checklist, and get ideas for more summer fun ideas. Katey writes about activities for families and children at Having Fun at Home. You may also enjoy posts Katey has written about exploring the Bee Cave Sculpture Park, Barton Creek Greenbelt, Sweet Berry Farm, Lady Bird Johnson Wildflower Center, Longview Park, Austin's Superlative Landmarks, the Elisabet Ney Museum, and Oakwood Cemetery. She has also written about taking kids to explore fun Austin stores like Callahan's, The Natural Gardener, Nature's Treasures, Zookeeper, and the Asian Supermarket.